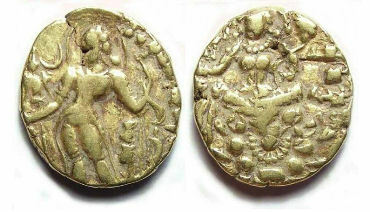 Chandragupta II, ca. 380 to 414 AD. Size: 17.4 x 19.7 mm. Weight: 8.14 grams. Grade: Fine but with flan flaw towards the upper centre where you can actually see light through the coin (a flan crack tht widens at that point). Obverse: King standing forward, holding a bow, with a Garuda standard to the left, with an inscription that reads DEVA SRI MAHARAJADHIRAJA SRI CHANDRAGUPTAH.. Reverse: Lakshmi seated forward with legs crossed, on a lotus with in inscription that reads SRI VIKRAMAH around. 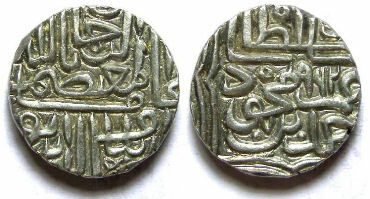 Ghiyas-ud-din Ahmad Shah III,AD 1554 to 1551. Date: AH 962 (AD 1554 to 1555). We use India here to mean the Indian sub-continent, and include non-islamic coins from India, Ceylon, Pakistan, Afghanistan, and other nearby regions.